Back into one-word band names again today with Spitfire. Coming out of the indie wastelands of Crawley, the band were another band formed by two brothers (Jeff and Nick Pritcher) and bulked up to the standard five-piece by Steve White, Scott Kenny and Matt Wise. 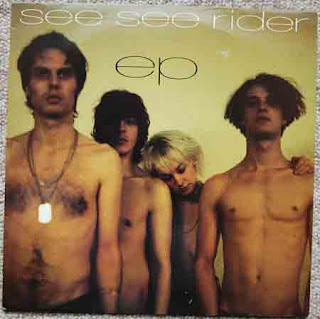 Membership changes later in the band's life saw white replaced by Simon Walker (who latterly joined The Auteurs) and Kenny leaving the drum stool which was filled by Justin Welch (later a member of Elastica). 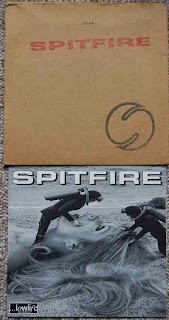 Formed in 1990, Spitfire released a good half dozen singles; leaving their shoegazing beginnings behind to go more indie pop/rock, a couple of albums (much delayed debut Fever eventually surfacing in 1993) and recorded a Peel Session in 1991. It's also suggested in a number of places that the band took the rock and roll lifestyle a bit too seriously with reports of less than subtle banging on in the NME and the like and freely handing out backstage passes to groupies; neither being particularly popular traits with their record companies needless to say! This track "Rubber Rosie" is a bit of an odd one though. It's undeniably Spitfire (it appears on their 'official' site, but it doesn't get a mention in either of the places I usually look for background; discogs and in Martin Strong's Big Boys Book of Indie), so what we're supposed to believe I'm not sure. Maybe it's the rarest thing in the world ever? More likely it's just one of those things. This particular copy comes in a nice cardboard sleeve with Dickie Davies' World of Sport-esque "S" logo. I've been meaning to do Scorpio Rising for ages, but kept forgetting. Then when I remembered I convinced myself I'd already done them. This is one of the perils of ageing. Still, better late than never. The Liverpudlian baggy/fraggle funsters were formed in 1989 by Mickey Banks, "Sploote", Martin Atherton, Steve Soar (who left in 1993) and Colin Owens. That's a rock and roll name. Colin. There should be more famous rock star Colins. I can only think of Colin out of the Shamen off the top of my head. This is another peril of ageing. Sorry. formed in 1989, the band toured extensively with such indie luminaries as Ned's Atomic Dustbin, the Senseless Things and PWEI and I'm pretty sure I saw them support Carter USM in the early 90s, although my first port of call for all things Carter doesn't seem to back that up so it's probably my memory again. There's not that much on the band kicking about on the internet, which is a shame. The myspace and wikipedia page say pretty much the same thing, although the book I have in my hand seems to suggest that the band's first single is called "Stangest Times EP", but both those pages call it "The Strangest Things Turn You On". The actual bit of vinyl is called the "Stangest EP" and the track is indeed "Strangest Things Turn You On"; the normally pretty infallible Discogs doesn't even list it. Come on internet, buck your ideas up! Whatever it's called, it's a cracking bit of indie which possibly sounds a bit more Madchestery than I remember, but certainly has some lovely swooping guitar and that very recognisable indie drum beat that cropped up a lot in 1991.